John Templon is the RTC correspondent for America East. You can also find his musings online at NYC Buckets or on Twitter @nybuckets. The top four seeds in the America East have been dominating conference play all season. That’s why they’re expected to meet up in the semifinals. The team that could potentially crash the party is six-seed Hartford, which is playing close to home. If the Hawks get hot from three, there’s always a chance to pull an upset, because they love to shoot the long ball. 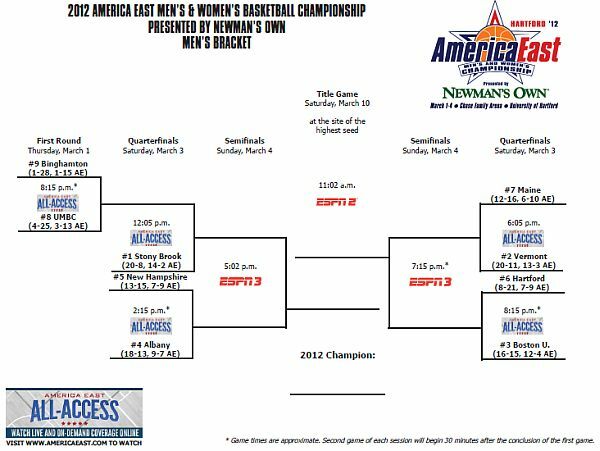 Also, seven-seed Maine has a ton of talent, but crashed at the end of America East play, losing six of its final seven games. The highest seeded team that survives Hartford is going to get the opportunity every team wants, to host 40 minutes of basketball that will ultimately lead to a berth into the NCAA Tournament. It should make for an exciting, gritty long weekend and championship game. At the beginning of the season the expectations were that Boston University, Stony Brook, Vermont and Albany would be at the top of the standings. At the end of the season, that’s exactly what we’ve got, except they’re in a slightly different order. An injury to D.J. Irving seemed to throw BU off its rhythm a little bit, but the Terriers still finished 12-4 in conference, including a win over Stony Brook and a sweep of Albany. Vermont benefited from the continuity of having John Becker take over for Mike Lonergan, but an upset loss to Binghamton, the biggest surprise of the conference season, leaves them slightly behind the eight-ball heading into the conference tournament. But it did save the Bearcats from the indignity of needing to win the play-in game on Thursday to avoid a winless season. The rest of the bottom of the standings worked out pretty much as expected. None of the other teams has managed to crack the upper echelon of the conference. Hartford, after starting the season 0-13, rebounded to finish 7-9 in conference and qualifies as America East’s biggest surprise. Gerardo Suero's Quickness And Scoring Ability Caused Headaches Across The Conference. Player of the Year: Gerardo Suero, Albany – He burst onto the scene this season after a long, circuitous route to upstate New York. On the way, he learned a lot of tricks on offense and it showed, as he was incredibly efficient while using the third most possessions in the nation when he was on the court. Suero averaged 21.7 points per game and also contributed 5.7 boards and 3.0 assists. 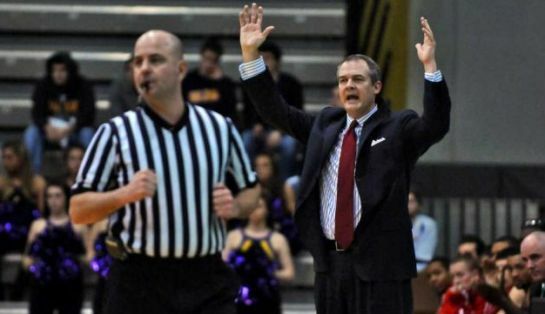 Coach of the Year: Steve Pikiell, Stony Brook – Pikiell wins this award because his team finished in first place. It’s tough to deal with expectations and he’s formed a talented rotation into a team that can have a different person beat you on any given night. This is the second time in three seasons that the Seawolves have won the regular season title. This time, Stony Brook needs to finish the deal and qualify for its first ever NCAA Tournament. G Darryl Partin, Sr., Boston University – This team was supposed to be Partin’s this season, and after a midseason injury to D.J. Irving, it truly was. He did a good job as the go-to guy, holding down the fort and scoring 19.7 points per game until his running mate was ready to go again. G Bryan Dougher, Sr., Stony Brook – The designated gunner on the conference’s best team, Dougher shot 37.3% from three and scored 13.4 points per game, the highest of his career, in the fewest minutes per game in his career. F Tommy Brenton, Jr., Stony Brook – Brenton isn’t your traditional First Team player, but his defense made him one of the key players in the Seawolves’ rotation. He averaged 7.9 points, 7.8 rebounds, 3.3 assists and 1.5 steals in 29.4 minutes per game this season. F Brian Voelkel, So., Vermont – Voelkel didn’t score much, averaging just 4.9 points per game, but he was amongst the America East leaders in rebounds at 8.3 per game, and assists at 5.0 per game. Freshman of the Year: Four McGlynn, Vermont – McGlynn and his top competition for this award, Maine’s Justin Edwards, look like they’ll be great cornerstones for their respective teams for years to come. McGlynn, though, was more consistent overall this season. He scored 24 points in 27 minutes in a 68-49 win over Stony Brook that was the Catamounts best victory of the season. Defensive Player of the Year: Tommy Brenton, Stony Brook – At 6’5,” Brenton has the ability to cover anyone in America East. He’s an excellent rebounder and his offense comes from his defense. Always taking on Stony Brook’s toughest assignment, he led a defense that finished first in conference play by allowing 0.91 points per possession. Stony Brook (20-8, 14-2)– The Seawolves have good wins at home over Cornell, Rider and Columbia, but a victory at Northeastern during BracketBusters was the first road win for SBU outside of conference play. Considering how down America East is in general this season, Stony Brook might end up in the play-in game and they could definitely win it. Vermont (20-11, 12-3) – The Catamounts own the America East’s best win – over Old Dominion in overtime – and its worst loss – at Binghamton. This is a solid team, but it needs every player on its game in order to win the slowdown games Vermont likes to play. Boston University (16-15, 12-4) – The record isn’t great, but most of it can be traced to losing D.J. Irving right before a key stretch in conference play and a lack of options in the frontcourt. Joe Jones did figure out a way to beat top seed Stony Brook once, at home, but they were swept by Vermont, their likely semifinal opponent. The second one was close, 68-67, and gives the Terriers hope they can repeat as champions. Albany (18-13, 9-7) – Head coach Will Brown has a contract extension, but the length and terms won’t be announced until after the postseason. That makes it sound like he has a lot of incentive to get the Great Danes some wins. The potential is there with Gerardo Suero, Mike Black and Logan Aronhalt. The problem is up front. UA suffered two losses to Stony Brook by a total of 20 points because there’s no one who can handle SBU’s size. New Hampshire (13-15, 7-9) – The Wildcats are hot, having won five of their last six games, including the last one Albany and UNH played on February 9. They’ve been winning close games over the elite (Albany, Boston U.) and taking care of business against the bottom. It’s straight to the elite teams on Saturday with Albany. Hartford (8-21, 7-9) – A number of talented freshmen, including Nate Sikma and Mark Nwakamma, give the Hawks something to build upon. There’s also some positive momentum considering the 8-8 finish to the regular season after the winless streak to start. John Gallagher had to spend a lot of time getting his team ready for this level, but it should pay big dividends in 2012-13. Maine (12-16, 6-10) – So much talent, so little to show for it. Justin Edwards and Alasdair Fraser are great blocks to build around, but they’re going to need some more help. The departures of Gerald McLemore and Raheem Singleton is going to leave holes in the offense next season. What Ted Woodward really needs is for his team to commit to play defense. Maine has allowed six of its last seven opponents to score at least a point per possession and lost each of those games. UMBC (4-25, 3-13) – Losing Chris De La Rosa at the beginning of the season basically tanked the Retrievers’ season. Along the way, though, Chase Plummer picked up a lot of the slack and walk-on Ryan Cook became an integral part of the rotation. Both those players will be back next season as UMBC tries to find a new way to hold down opponents after surrendering a conference-worst 1.12 points per possession this season. Binghamton (1-28, 1-15) – All those losses have exposed the fact that changes still need to be made in upstate New York. The Bearcats have left Mark Macon with an almost impossible situation and while there’s some talent on the roster, Robert Mansell’s knee injury and Ben Dickinson’s immature actions on the court leave questions that need to be answered before next season. Walk-on Sensation – With Chase Plummer sidelined due to a concussion against Albany, former walk-on Ryan Cook took over the scoring duties for UMBC and scored a career-high 28 points in an 11-point defeat on the road. In the Retrievers’ next game against Maine, he teamed up with Plummer to help them almost pull the upset, before falling 78-77 in overtime. Cook scored 21 points in that game. The junior guard has scored 20 or more points four times this season after not appearing in a collegiate game until recently. Vermont’s Near-Miss– The Catamounts had a 16-point lead with 3:28 remaining against Boston University, but they almost blew it. BU had two opportunities to hit a three in the final 11 seconds that would’ve sent the game to overtime, but both clanked off the rim. The win put Vermont in sole control of second place in the conference. Binghamton Falling Hard – The Bearcats are currently winless on the season. Even Towson has a victory, but the closest Binghamton has come was six points at Albany and eight points at Maine. I’ll bet Mark Macon wishes his team had gotten the monkey off their back in the opener against Colgate, which the Bearcats lost by four. This lede pretty much sums up where things stand right now. The Seawolves Are Running Towards A Conference Title. 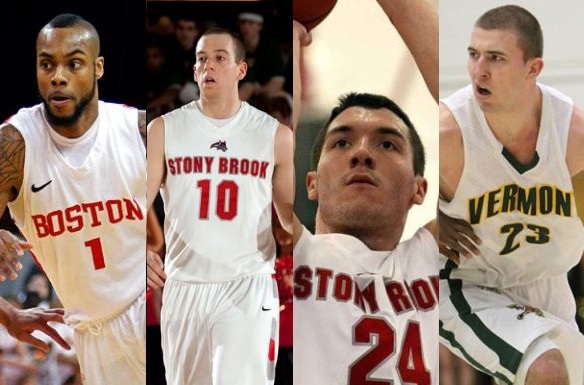 Stony Brook (16-7, 11-1) – The Seawolves haven’t gone to Vermont yet, but other than that SBU has passed every test an America East team must face. The defense is top-notch. The offense is unspectacular but Tommy Brenton and Bryan Dougher get the job done. Against New Hampshire, Brenton shot 12 free throws and finished with 14 points. John Templon is the RTC correspondent for America East. You can also find his musings online at NYC Buckets (http://www.nycbuckets.com) or on Twitter @nybuckets. Close Calls: The teams of America East have found themselves on the wrong end of close scores early in the season. The nine teams are a combined 1-8 in games decided by five points or fewer or in overtime. That includes Vermont’s two-point loss against South Florida, which would’ve been a big scalp for the league. The Catamounts also got the league’s first close victory with an overtime defeat of Old Dominion, 77-75 in overtime, on Tuesday. New High Scorers: Two of the leading scorers in America East this season weren’t here in 2010-11. Albany’s Gerardo Suero has given the Great Danes a go-to guy and freshman Justin Edwards is leading the way for Maine. See Albany’s section below for much more about Suero. What’s impressive about Edwards, a Canadian import, is that he’s also leading the conference in steals in the early going with 3.5 per game. Edwards was named the America East Rookie of the Week for his efforts last week. Slow Starts at the Top: Vermont, Boston University and Stony Brook were supposed to be the class of America East coming into this season. The Catamounts won two games they should’ve but lost to Long Island in their final game of Hall of Fame Tip-Off Tournament. The Seawolves suffered a tough loss to Sacred Heart and the Terriers fell to Northeastern and Cornell. Those are the types of 50/50 games that the top third of the league needs to win in order for America East to get some more respect moving forward. Matt McKillip of Purple and Gold Nation is the RTC correspondent for the America East Conference. Injury Updates: Brenadan Bald and Evan Fjeld were held out of practice for Vermont- if they’re significantly hampered, the Catamounts will need heroic efforts from the rest of their cast. Their body of work has been garnering 14-seeds from bracketologists, but health will be the key factor to weather they will dance. Hot Black: Albany’s Mike Black was the best player in the conference over the past week and if he can keep it up, the Danes will be a tough out. Maine Who? : Maine has been the best in the league– and has also bottomed out with losses to basement dwellers. The talent is there, but can three point threat Gerald McLemore and crew rally to their former selves after losing seven of their last eight games? War of Attrition: Part 2, The Rolling of the Ankles: It has been a rough season for star players in the America East. Pre-season POY candidate Tommy Brenton went down for Stony Brook before the year started, and then New Hampshire lost two leading scorers during the non-conference (Alvin Abreu and Ferg Myrick). In the past week though, a series of sprains have created a lot of uncertainty for the playoff picture. John Holland of Boston University, the league leader in scoring, was kept out of the final regular season game with an ankle Injury, as was one of Vermont’s top scoring threats, Brendan Bald (11.5 PPG). And then in the final game of the year, another POY candidate, Evan Fjeld of Vermont, rolled his ankle and was kept out for the rest of the game. While all are likely to play the entire postseason, it marks a potential weakness for the two top teams in the league. Conference Player of the Year: John Holland, Boston University. The senior Holland was the presumptive favorite after being showered with post-season recognition accolades during his first three seasons. Despite leading the league in scoring (19.9 PPG) essentially wire to wire, Holland’s year got off to a bumpy start. Holland struggled to assume a leadership role with a young and transfer laden cast- his shot selection especially struggled. But as conference play turned towards the home stretch, Holland led the Terriers to 8 straight victories entering the post-season. Matthew McKillip is the RTC correspondent for the America East Conference. Hope You Didn’t Believe It: At last check in, the Binghamton and Hartford were one-two in the America East standings. Now, they’re sixth and fourth, respectively, with Binghamton having dropped five straight games. The Cellar Has Teeth: UMBC has 18 losses this year, but that did not stop them from taking down Boston University and Hartford in back-to-back games. But alas, they got blown out by fellow bottom-feeder New Hampshire and then couldn’t hold onto a 12-point halftime lead against Albany. A Barnies Burner: Maine senior forward Troy Barnies has blossomed into one of the most consistent players in the league this year (14 PPG, 8 RPG) and has been crucial to steadying a deep, but sometimes inconsistent Black Bears team. 1) Maine (13-7, 7-1): A convincing win at Vermont, 72-58, gave Maine the inside track for #1 seed (and home court advantage for the championship match). The two convincing wins against AE weaklings shows they can take care of teams they should be beating solidly. A six-game winning streak and a Gerald McLemore who is slowly coming back to form have things looking bright in Orono. 2) Vermont (15-5, 6-2): Loses against both Maine and Boston University throw into question whether this team has the ability to dance this season, especially with questionable guard play. Freshman Sandro Carissimo has seen some time at the guard position, but still hasn’t proven that he’s the answer. 3) Boston University (10-12, 5-3): “Most talented team in the America East, but…” It’s been a refrain this season, but never as much as the last two weeks. Horrible blown leads at Hartford and UMBC have left people questioning whether John Holland, the most skilled player in the league, has the make-up to be a crunch time performer. 4) Hartford (7-13, 4-3): Joe Zeglinski single-handedly ended Binghamton’s dream world with a 7-11 performance from three, but this team still relies very heavily on streaky shooters. Zeglinski and leading scorer Morgan Sabia both shoot under 35% from three and are prone to painful off nights. 5) Albany (11-12, 4-4): Down twelve to UMBC (literally the only AE team the Great Danes could beat least season), some fans were reaching for the panic button. Luckily, Logan Aronhalt snapped out of a prolonged slump and added to the week’s “thundersnow” outside with 20 second half points. 6) New Hampshire (8-12, 2-6) The floor drops out at the sixth spot. No one had really done much to earn it. New Hampshire gets the nod because despite the barrage of injuries and the recent temporary, but vague suspension of big man Dane DiLiegro, the Wildcats upset Hartford with a 33-point outburst from Tyrone Conley. Pogo stick forward Brian Benson has also chipped in a few nice performances on the glass. 7) Stony Brook (7-12, 2-5): The Seawolves simply cannot score. Brian Dougher is a second or third option player, and when teams can key on him, it’s just hard for him to find a rhythm. Albany scored one point in the final ten minutes against Stony Brook… and won. 8) Binghamton (6-15, 3-5): This team is in an embarrassing stretch, punctuated by 39-point beatdown at the hands of rival Albany, but their dominance over the bottom of the league keeps them from the cellar. This team still has some fight… but only about once every three or four games. 9) UMBC (3-18, 2-6): There was a brief moment of hope- two huge wins over BU and Hartford and two winnable games on the schedule. Dreams of .500! But then the rest of the team faded away behind stat-piling point guard Chris De La Rosa. Who thought of that one? In a strange scheduling choice, Hartford follows up it’s loss at Vermont with a game at Stony Brook then immediately welcomes Vermont at home. The rematch at Chase Arena will be a revenge game… and the wounds of the loss should be fresh in the Hawks’ mind. Player of the Year…Benched? The presumptive pre-season POY, John Holland of Boston University, has been sentenced to coming off the pine by coach Patrick Chambers until he shows better aggressiveness and leadership. The 6’5 Holland is still putting up 17.5 points a game, but he has seen his shooting percentage plummet from last season: 46% to 35%. Leader of the (straggling) Pack: Vermont has been the class of the league, but there hasn’t been much competition. They dropped a game to BYU in Glens Falls, New York, but there’s no shame in that, as they remain solidly in the mid-major polls at #16. King of the Town: Albany snapped a five-year losing streak to bitter cross town rival Siena in a thrilling 88-82 overtime victory. Maine over UMass: Quality wins have been few and far between for the America East; Maine’s upset of UMass is one of the AE highlights to date. Giant Killer Potential: Vermont’s Brian Voelkel and Albany’s Tim Ambrose. The freshman Voelkel has a nice resume so far as the league leader in rebounding and steals, and he has the second-most helpers in the conference. He decided the scoring column could use more ink last Sunday, when he dropped 23 points on Marist to go along with a typical 16 boards, three assists and five steals. Ambrose is on the other side of the spectrum, as the senior is going through a renaissance. He’s collected two straight POW awards while dropping 27 points on Siena and 21 in a victory over CCSU that he salvaged single-handedly. Down two with a minute left to play, Ambrose took a pick-six steal in for an easy layup, then with under ten seconds on the clock, he drained a rainbow floater for the victory. Vermont (7-2): There’s no competition for the top spot in the AE, but Vermont will test its mettle against MAAC favorites where we’ll find out just how good this team is when they pay visits to Fairfield and Iona. Forward Evan Fjeld continues to be excellent, but the Catamounts are relying heavily at the guard spot on 5’8 Joey Accaoui. He’s been scoring efficiently, but he’s a defensive liability, and it will be interesting to see if the top guards in the MAAC can take advantage. Maine (4-5): The Black Bears’ victory over UMass in a slugfest showed that they will again be a contender this year… but strangely, they’ve still done it without anyone playing particularly well. Gerald McLemore still is shooting poorly, and the ten-man rotation seems to score by committee. It’s too early to tell if the balanced attack is sustainable, but it feels like this is a team that needs to find offensive consistency if they are going to have success in conference. Albany (5-6): The upset of Siena was euphoric for a struggling program. The aforementioned Tim Ambrose has been a rock, and flanked by sophomores Mike Black and Logan Aronhalt, it is safe to say the Great Danes have the top backcourt in the league. The problem is a lack of depth at guard behind these three, and the balance of the season hangs on every injury scare. New Hampshire (4-3): Dane DiLiegro is one of the top post threats in the league and he’s clocking in at a solid 13.0/9.7, but he will need to assert himself more on a nightly basis. The Wildcats do not have an impressive win yet this season, but they haven’t had any horrible missteps and their losses to good teams have been close. Three straight road games ahead (Rhode Island, Central Conn. State and Cornell) will tell us a lot about this team. Boston University (4-7): No one expected to see the Terriers this low this season. A four game skid has included handing away a game at Bucknell, losing an early lead against LaSalle and then just quitting in the second half against Harvard. The pieces are there, but there is no mesh. The team has leaned heavily, very heavily on the three-point shot, which they haven’t made very often. A turnaround on this young team must start with John Holland. Binghamton (2-8): Out of the coma! After a miserable stretch, Binghamton was a free throw in regulation away from upsetting Hofstra before losing in overtime at the hands of an monster night from the Pride’s Charles Jenkins and his 32 points. The Bearcats followed up the strong showing with a victory of Manhattan behind a 20-point outburst by Mahamoud Jabbi. Hartford (2-8): In one of the most cringe-worthy losses of the year, Hartford lost a twenty point lead deep in the second half to Sacred Heart. They followed it up with a double OT loss to Monmouth to keep the bad taste in their mouths. The Hawks’ current 17-day break just doesn’t seem good for team’s psyche. UMBC (0-10): Among a chosen few left in the race for longest winless stretch, punctuated by a 81-39, THIRTY NINE, drilling by Rider. It’s a two man team, Chris De La Rosa and Travis King, and it’s ugly. Vermont faces a key road trip as they play Fairfield and Iona Monday and Wednesday, respectively. New Hampshire ups the ante in the coming weeks with a host of challenging games on the road, Rhode Island (12/18), Central Connecticut State (12/22) and Cornell (12/29). 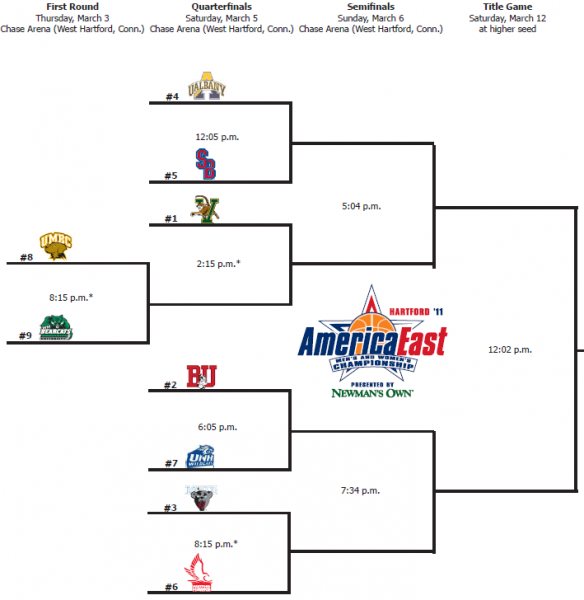 BU needs to right the ship at home with two tough matchups ahead versus St Joseph’s (12/21) and Quinnipiac (12/29). Stony Brook for Breakfast: Those not heroic enough to last the full 24 hours had a chance to wake up to Stony Brook’s 6 am game, or the last half for those who couldn’t quite get out of bed at six. The Seawolves won a sloppy but exciting game, 51-49, over Monmouth. Road Warriors: Vermont notched the top win so far of the season when they snapped Siena’s 38-game home winning streak, and followed it up by scaring UConn, leading 36-33 at half in that one. Down With The Generals: Boston University defeated George Washington to set up a match up with Villanova, where coach Patrick Chambers was formerly an assistant, but the Terriers could not hang with the #7 team in the country. Vermont (1-1): The Catamounts defeated Siena behind senior Evan Fjeld, his incredible mustache and the astonishingly steady hand of freshman Brian Voelkel who nearly notched a triple-double in his first ever game with 9/10/9 assts. For an encore, they dominated Connecticut in the first half before a career night from Kemba Walker pushed the Huskies ahead. UVM’s point guard issues are not settled, but the freshman do not show their age and the team executes excellently in the half court offense. After returning only one starter, Coach Lonergan again has made Vermont the team to beat in the America East. Boston University (1-2): The Terriers lost a close decision to a crosstown rival Northeastern, followed it up with a nice win over George Washington, but then were no match for Villanova the following night. Freshman guard D.J. Irving has earned a starting spot and, boy, is he quick out there — and that means something when you’re watching him on the same floor as Villanova’s guards. He’ll need to improve his jump shot, though — opponents sag well off him around the perimeter. Dom Morris and Patrick Hazel have shown flashes inside but will have to grow into their roles. John Holland continues to pour in the points, but one warning sign could be how tight of a rotation coach Patrick Chambers is keeping, as he is only going seven deep. Maine (1-1): Maine has received an early boost from senior forward Troy Barnies while preseason all-conference pick Gerald McLemore has been ice cold (5-24 FG). Transfer Raheem Singleton is fitting in nicely at point guard, but it is hard to get a read on this team. The first four games alternate between easy opponents and unwinnable games: Utah Valley State, Maryland, Maine Machias (a D-II school) and Notre Dame. New Hampshire (1-0): UNH has been the least active team in the America East, only playing one game so far, and they had to overcome a sluggish start to clip Dartmouth in their first game. Tyrone Conley had 18 points and led a balanced attack that included a double-double from big man Dane Diliegro. The lead story, though is that last year’s leading scorer and second team all-conference player Alvin Abreu (14.4 PPG) was hurt in the team’s lone game and there are rumors that he is out for the season. Stony Brook (3-1): After getting drubbed by UConn, Stony Brook has cruised through a schedule of powder puff teams. This seemed foolish when the Seawolves were conference favorites, but now that Tommy Brenton is lost for the season, easing into the year is prudent. Chris Martin has been a consistent player, but it appears this team will live and die by the three point shooting of Bryan Dougher. Forward Al Rapier received no attention coming into the season, but the 6’7 JuCo transfer has become the primary beneficiary of Brenton’s injury — he’s turned into a nice role player (8.5 PPG, 7 RPG). Hartford (0-2): Morgan Sabia has been the surprise of the season so far; he is thriving under first year coach John Gallagher. The 6’8 forward scored 23 points in each game (he averaged 11 last season) while shooting over 50% and grabbing 9.5 RPG. The Hawks are struggling to get over the hump though, losing each of their first two games by two points. Binghamton (1-1): Talk about a one man show. Greer Wright has scored 48% of the Bearcats’ points so far. He led them to a two point victory of Colgate in the opener, but on Wednesday night, Binghamton took an 18-15 lead over Bucknell with 8:50 left in the first on Wednesday night… and then didn’t score for the rest of the half. The final score was 66-38. Thirty eight! It looks like it’s going to be an up-and-down season for Binghamton until they need to find a reliable second scorer. UMBC (0-2): The pieces are starting to take shape, but the Retrievers have not put together a complete effort yet. Transfer Travis King is establishing himself as the teams deep threat, scoring 22 points in a loss to Loyola (MD). Freshman Chase Plummer is off to a fast start after scoring in double figures in the first two games. This team has been able to put up points and if they learn how to close out games, they will be a sleeper in the America East this year. Albany (0-3): After taking a nine point lead on Cornell early in the first half, starting point guard Mike Black went down with an ankle sprain and it’s been a downward spiral since then. Since he’s been off the court, no Great Dane can hang onto the ball or find anything but iron on jump shots. It has felt at times that senior Tim Ambrose is the only thing standing between the Danes and a shutout. Australian freshman Luke Devlin has been a bright spot, putting in a lot of minutes and posting 10 points and 9 rebounds in his first game. Logan Aronhalt has been in double figures for all three games, but he has been wildly inaccurate. Coach Will Brown hopes to build on a solid second half against Georgia Tech as the team looks forward to Black’s return. Vermont snaps Siena’s 38 game home winning streak. Maine has won five straight since the loss at Vermont. The Black Bears now have sole possession of first place. Stud Player– Gerald McLemore, soph. G – 24 PPG in two wins away from home. McLemore is really coming into his own including a 7-11 night from downtown against Hartford. He is helping Maine get off to a great start. Two teams received votes in the most recent mid-major top 25 poll, while another is off to their best start since joining the league in 2001-02. There is still one team looking for their first victory. Maine is playing their best ball in years. They have won five straight, eight out of their last nine, and ten out of their last 12. Sophomore Gerald McLemore shined in the most recent game out finishing with a career high 27. McLemore shot 7-11 from downtown in helping the Black Bears beat Hartford. Terrance Mitchell played great off the bench, scoring 17 points. As a team the Black Bears shot 12-18 from three-point range. McLemore is starting to heat up — in the previous game at Albany he scored 21 points. Mitchell has also developed a scoring touch, hitting double-digits in points in his last six games. Stony Brook is sitting in second place in the league at 6-2. They are the only team to knock off both Boston University and Vermont, and did so on the road in both games. At UVM last week Bryan Dougher scored 20 points to help the Seawolves win. Stony Brook followed that up with a win over Albany. Freshman Marcus Rouse led the way with 17 points while Tommy Brenton added 14. Their combined 31 points came on a combined 13-for-15 shooting. Boston University has won seven of eight, with the only blemish at Vermont. They fell behind early by a lot against the Catamounts and were never able to cut into the lead very much at all, losing 78-58. The Terriers have followed that up with two big wins. They beat Albany by 21, then followed it up with an 18 point win over UMBC. John Holland scored 25 points and had 12 rebounds while sophomore Jake O’Brien added 18 points. It was the first team BU had swept this year. Holland and O’Brien had big games in that one, too, with 21 and 19 points, respectively. Carlos Strong also added six three-pointers for 18 points. The team as a whole hit 16 long balls setting a school record. The offense is clicking and averaging over 70 PPG, good for first in the league. Vermont started off the conference schedule with five straight wins, all with margins of eight or more. The Catamounts were beating their America East foes by an average of 14+ points a game. They have since hit a wall in losses to Stony Brook and Binghamton. 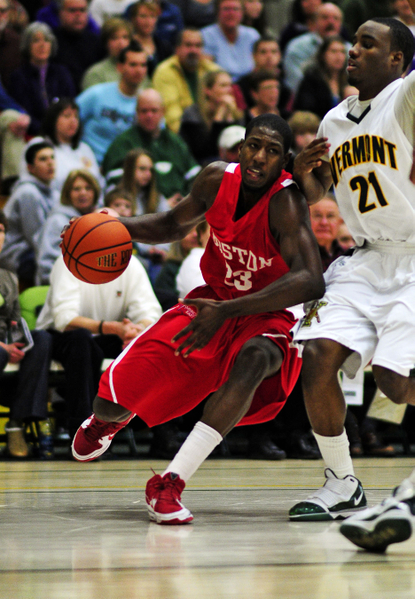 In the loss to Binghamton, Vermont was led by guard Maurice Joseph, who scored 29 points. Marqus Blakely had his second straight double-double with 14 points and 12 rebounds. Binghamton is the ultimate surprise so far halfway through the year. They lost at Hartford by one, 64-63, then bounced back well with a win over Vermont. Eight of the Bearcats’ 22 games have had differentials of five points or less this year. Vermont had no answer for Binghamton’s Greer Wright in the game. Wright scored 30 points and pulled down ten rebounds for the Bearcats. The Bearcats should also be proud of hitting 10-for-12 from the foul line. Hartford is only 3-4 in league play this year including, most recently, a 77-69 loss at home against Maine last week. Charles White and Joe Zeglinski led the way with 18 points and Morgan Sabia added 16 points. New Hampshire played four of their first six league games on the road and were only victorious in one of them. The last game was against winless UMBC and the Wildcats managed to come out on top by a slim margin, 62-58. Alvin Abreu played especially well, scoring 22 points for New Hampshire. Albany is lucky that UMBC is in the league or else they would be sitting at the bottom. The Great Danes’ lone victory came at the hands of UMBC. They have lost their last three to Boston University, Maine, and Stony Brook, admittedly the top three teams in the league. Luckily they are playing Hartford at home on Wednesday. Hartford and UMBC are the only teams who are worse on the road than Albany (Hartford is 1-10 currently on the road). 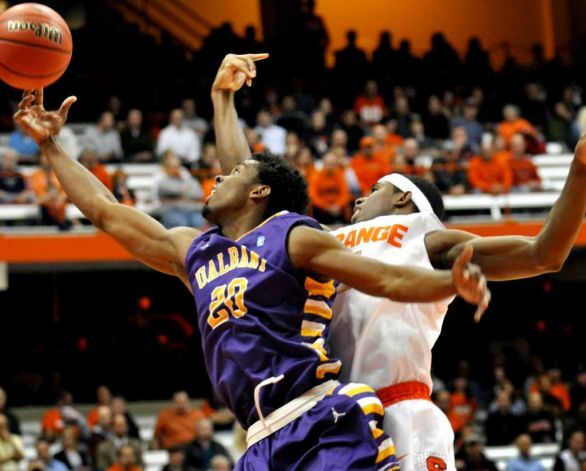 Tim Ambrose and Will Harris are still the only players who can score for the Great Danes. Both players are averaging over 14 PPG, while not a single other player is averaging even six points a game. UMBC still is looking for their second victory on the season and their first in conference. They are currently in the midst of a ten-game losing streak. It seems their best shot will be when they host Albany in the second weekend of February. They did come within four points in that loss against UNH last week. Even with the roll Vermont is on, it is hard to ignore the three-game winning streak that Maine have put together. The win over Columbia in New York was expected, but no one could have predicted the win at BC, and the Black Bears finished it off by snapping Princeton’s six-game winning streak. It seems Blakely may have taken offense to the most recent nomination of classmate Maurice Joseph as Stud Player of the week. In the last three games Blakely has recorded a double-double in each, reminding us who makes Vermont go. In the last two weeks we have seen two teams riding three-game winning streaks before facing off in their conference opener. One had beaten a team for the first time since 1924-25. It was the America East’s third victory against a BCS conference school this year. The other had been riding one of the greatest players this league has seen in winning eight out of their last nine. All the while the preseason favorite fell in their first game to the Seawolves who demonstrated their dominance over the state of Massachusetts. Marqus Blakely has led the way for the Catamounts recently. Vermont has won three straight and eight of their last nine. The only loss in the streak was to Delaware, 56-50. The most recent victory was a 73-58 win over UMBC in Vermont’s first conference game. In the victory, Blakely registered 17 points, 14 rebounds, and seven assists. It was his third straight double-double and eighth on the season (the school record is 17). In the previous two victories he recorded 26 points and 11 rebounds at St. Mary’s and 23 points and 11 rebounds at Marist. The victory over St. Mary’s was the Catamounts’ 14th straight over NEC teams. Senior guard Maurice Joseph added 15 points, including 12 from behind the arc. Check out Blakely’s current stat line on the year: 18.6 PPG, 9.4 RPG, 3.9 APG, 3.0 SPG, and 2.3 BPG. He is first in the America East in points steals, blocks, second in rebounds, and fourth in assists per game. No player in the history of the America East has finished in the top ten for every category let alone the top five. It was known coming into the season that he is one of the most versatile players in history of the league and it looks like he is putting it all together to statistically put together the best all around season in the history of the America East. Blakely broke the 1500-point barrier last week and is currently 29th with 1,547 points. He also is 14th with 858 rebounds and is among the top ten with 222 blocks. There are only seven players in history of the league who’ve hit the same plateaus in points and rebounds that Blakely has. When he is done this season, he may be one of three with 1700 points and 1000 rebounds. Maine managed to record three victories in a row including a huge victory at BC. The Black Bears rallied from eight down with six minutes left. Sean McNally made the deciding free throws with just over a minute left to give Maine a 52-51 advantage that secure the win. McNally played a great all-around game with 15 points, seven rebounds, and three blocks. Gerald McLemore chipped in with 14 points. Maine’s 52-51 victory over BC is the America East’s third victory this year over a BCS-conference school. Previously, BU beat Indiana and Vermont won at Rutgers. It was the first victory over an ACC school for an America East team since Vermont downed the Eagles 77-63, on November 14, 2006. After losing back to back games against Sacred Heart and Saint Peter’s, Stony Brook won a couple of games to push their record to 9-5. There was a victory over Holy Cross on New Year’s Eve at home followed by a win in the conference opener against preseason favorite Boston University. Against BU sophomore Bryan Dougher shot 8-10 from three-point range. He was the first player to score 30+ points for Stony Brook in almost two full years and the eight treys tied the school record. Dougher is shooting 17-24 in the past three games. Tommy Brenton added 15 points and 11 rebounds against BU. It was his third double-double of the season. New Hampshire beat Colgate, 63-55, before heading west and dropping the game against Santa Clara, 71-68. Tyrone Conley did all he could in California, scoring a career-high 28 points for UNH. The Wildcats took a 68-67 lead with 14 seconds left on a jumper from Chandler Rhoads, but Ray Cowels hit two free throws for Santa Clara to give them the lead back. Cowels followed it up with two more to finish off the game. To start off the conference slate they face Boston University at home where they have won eight straight dating back to last year. Albany managed to snap a four-game losing streak with a 21-point victory over Yale. Albany turned a six-point lead at half into a blowout in the second period. Tim Ambrose led the way with 22 points and Billy Allen finished with 21 on 8-9 shooting including 5-6 from three-point range. The game against North Carolina was the second straight year they have faced the defending champions. Even in losing Albany can find bright spots though. The Great Danes were down by 38 with less than eight minutes to go and managed to cut it to a final deficit of 17. It was the fourth-highest ranked opponent Albany has faced. Billy Allen’s (at the time) career-high 16 points seemed to have set the stage for his big game against Yale. Surprisingly enough, Binghamton has won two out of their last four after starting out 3-8, with only two wins against Division I opponents. In the Bearcats’ last game they took down A-10 foe LaSalle. The game included a big comeback by the Bearcats in the second half; they were down ten going into halftime. Greer Wright finished with 20 points and nine rebounds. Hartford is currently in the midst of a nine-game losing streak. The last two losses were to undefeated #3 Kentucky and St. Francis of Pennsylvania. The Hawks were destroyed 104-61 at Kentucky. The biggest loss of the game though was point guard Andres Torres who tore the PCL in his right knee. Torres is not expected to return for 4 to 6 weeks. Against St. Francis, Joe Zeglinski’s 17 points were not enough for Hartford. The Hawks shot 6-26 from three-point range compared to the Red Flash, who shot 6-12. After it seemed Boston University might be turning the corner before Christmas with three straight wins, they dropped their first two after Christmas. They lost by 14 to a good Dayton squad. The loss that hurt, though, was the league opener to Stony Brook. In the past 30 years the America East champion has only lost it’s opener twice, so BU is already starting from behind. The Terriers had no answer for Stony Brook’s deep range. They allowed the Seawolves to shoot 12-20 from three-point land. Sophomore Jake O’Brien led the way with a career-high 27 points in the losing effort. UMBC finally did get their first victory before Christmas over American, but have since continued their losing ways with four straight losses. The closest they got to a victory since the holiday was against Central Connecticut State. UMBC took CCSU to double overtime before losing, 89-86. Chris De La Rosa had 25 points in the loss.